David Lloyd led the resistance with an unbeaten hundred as Glamorgan batted through the final day to secure a hard-fought draw against Sussex at Hove. When Will Bragg was run out by Will Beer’s direct hit from mid-wicket two overs before lunch, Glamorgan were 108 for 4 and still trailed by 109. But Lloyd and Aneurin Donald joined forces in the afternoon to add 86 in 25 overs and although Donald eventually lost his off stump to Ajmal Shahzad for 44 playing no shot there was no shifting Lloyd. He offered a chance on 66 but Luke Wright failed to hold on to a thick edge at third slip off Stuart Whittingham, who was the pick of Sussex’s seam attack. Lloyd and Jacques Rudolph saw off the second new ball during a stand of 93 in 24 overs and Lloyd, one of only three Glamorgan batsmen to lodge a Championship century this season, reached his second hundred of the campaign by hitting successive deliveries from Will Beer to the boundary. He finished 102 not out from 168 balls, with 14 fours and a six, with Glamorgan 306 for 6 when the captains shook hands immediately after Lloyd got to three figures. Glamorgan, resuming on 30 for 1, lost Mark Wallace in the third over of the day when Whittingham angled one across him and Ross Taylor held a low catch at slip. There was some slow turn for Sussex’s spinners and Briggs struck in his sixth over when he ended 26 overs of gutsy resistance by night-watchman Owen Morgan by bowling him for 36. But it was hard work for the Sussex attack on a painfully slow pitch and Lloyd got his head down impressively. He hit a straight six off Will Beer and even when Sussex took the second new ball their tiring attack struggled to make much headway. Rudolph was eventually caught behind for 38 off an under-edge as he shaped to cut Briggs but Glamorgan were 70 in front by then and Sussex’s hopes of forcing victory had virtually disappeared. A desperately slow surface defied them in the end as only 20 wickets fell in four days, one of those to a run out. Sussex took 11 points from their seventh draw of the season and Glamorgan nine. Sussex captain Luke Wright said: “It’s been a tough four days but I was really chuffed with our guys. We wanted to play relentless cricket and I thought’s that what we did. We’ve not scored enough big runs this season so to see three of the guys get big hundreds was exactly what we’re looking for but we knew winning on the last day was always going to be difficult because that pitch seemed to get more lifeless rather than starting to turn and go up and down, it held together pretty well. 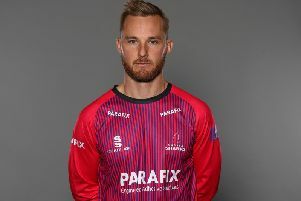 Centurion David Lloyd said: “Saving the game was a big challenge for us and i thought the way we occupied the crease was excellent. “When I went out there I just tried to be positive and fed off Aneurin Donald a bit, because he tried to play his shots and put away the bad balls. We dug in, were able to bat time and make sure we got a draw.